So this week’s Photo Friday Theme was “Bad hair.” Most of us picked the 80’s. Because you know, it was SO easy to find bad hair photos. I present for you, three of my favorite REALLY bad hair photos. This first one was a VERY happy day for me – it’s the day I met Hope from Days Of Our Lives. 1983. 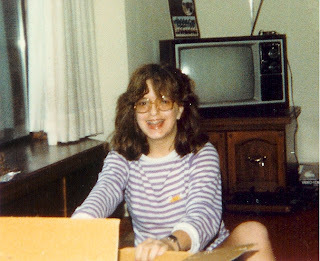 This next one is from 1982, I’m opening my Chanukah gift – it’s a record player. The plastic kind – with plastic speakers. My glasses were also part of the early generation progressives. Except they never knew when to be clear. I was very happy about my present. This last one is from my 13th birthday party – it was a surprize party my mom threw for me. (which explains why some of the girls were more like acquaintances than friends, but I digress…) It looks like a Farrah Fawcet convention – note the amount of feathered hair. You and I are twins, separated at birth. 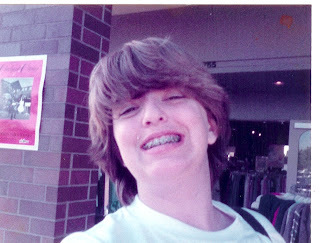 This may just be the motivation I need to take some digital pictures of my super-embarassing early teen pictures, including one where I look exactly like you at your birthday party. Hee hee, these are great. I think I had almost identical glasses at that age. 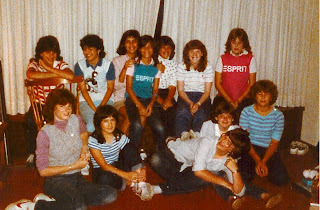 And I’m pretty sure I had the Esprit shirt I see on a few of your friends. And I know I had the feathered hair! Ahhhh, now all I need is some legwarmers. That 1st photo is so effing cute! hehehe too funny on the 80’s photos! I do like the first photo a lot. I had huge glasses too back then, they were hideous and always fell down on my little nose! I love 80’s hair. It is so funny to look back at all those pictures and think man what was I thinking back then. Glad you shared them.